With foldable phones attracting all the attention recently, ZTE is keen to be a part of what is possibly the next big thing. The company filed in a patent for a phone that folds vertically similarly to Motorolla’s alleged 2019 RAZR. More interestingly, the patent shows that the device will fold inwards, but not in the middle as the upper half of the flexible screen appears shorter. There is no physical cutout for a selfie camera so it remains to be seen how the company plans to implement that feature. There are two buttons on the right side, presumably for volume and power controls as well as a sim tray. On the back, we can see the camera setup, while the bottom features two symmetrical cutouts and what appears to be a USB-C port. ZTE is no stranger to the foldable smartphone game as it pioneered the design with its Axon M back in October 2017. At that point the technology clearly wasn't there yet though, which combined with the company's temporary ban in the US led to the failure of that phone. 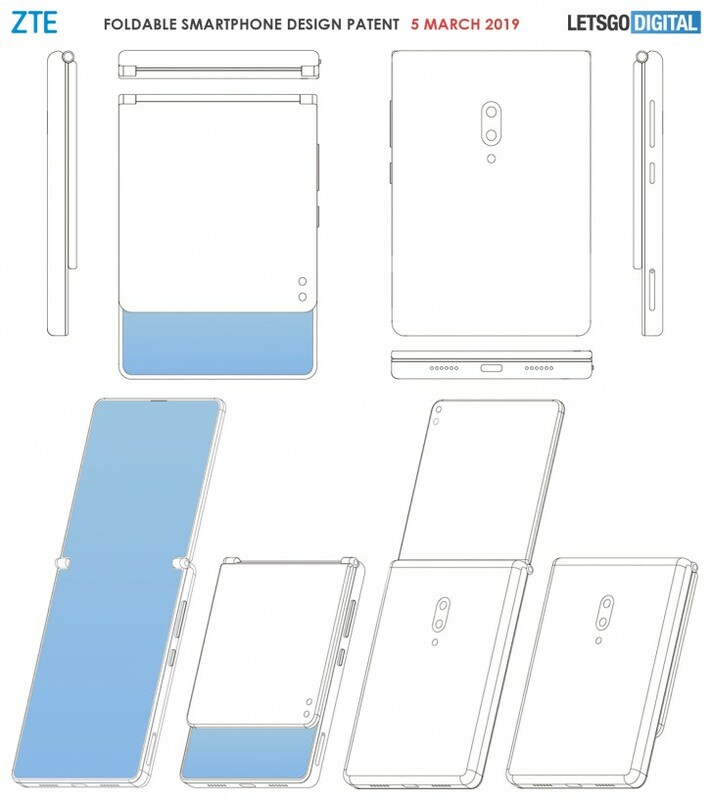 In December 2018, ZTE published another patent showing a device similar to Samsung’s Galaxy Fold so it remains to be seen if the company will employ both designs or is just keeping its options open. The point of having a foldable phone is to have two screens instead of one that just folds, both inward and outward folding phones are gimmicks and more prone to damage anyway.